Today is the day! Taxes are due! Is your bank account feeling a little lighter today? There are several businesses who are looking to help ease your burden today in the form of FREEBIES (and some other not quite free but really great deals)! Here is a list of what I have found so far… some places may not be in your area, but hopefully you will find a few deals you can snag! Baskin Robbins – Download their app, you’ll find a few deals to ease your tax burden, including $2 off a large Cappuccino Blast and buy-one-get-one-free $0.99 ice cream cones. BJ’s Restaurant & Brewhouse – Half off large, deep dish, or tavern cut pizza. PLUS… free delivery fee through May 5th. Boston Market – On Tuesday, April 15, any guest who dines in can get a $10.40 Tax Day Meal Special, which includes a Half Chicken Individual Meal with 2 sides, cornbread, a regular fountain beverage and a cookie. Bruegger’s Bagels – Participating bakeries will offer Bruegger’s famous Big Bagel Bundle for just $10.40. Sign up for Breuggers Inner Circle. 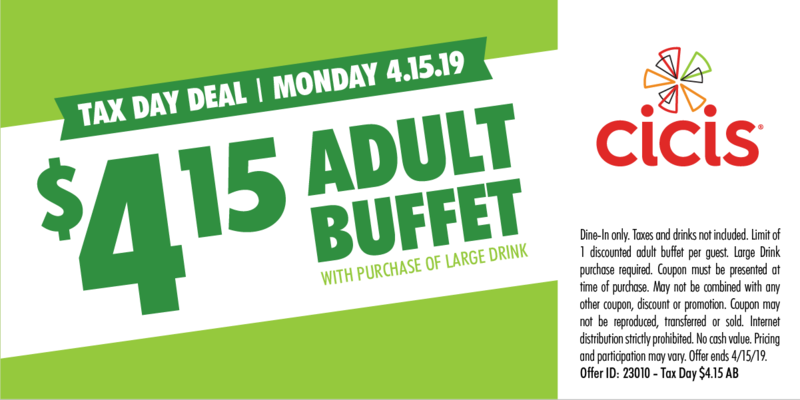 Cici’s Pizza – The price of the all-you-can-eat buffet drops to $4.17 today only. You’ll need this coupon to get the deal. Dunkin’ Donuts – For Tax Day, DD Perks loyalty members can get a medium hot or iced coffee for $1 at participating restaurants nationwide. 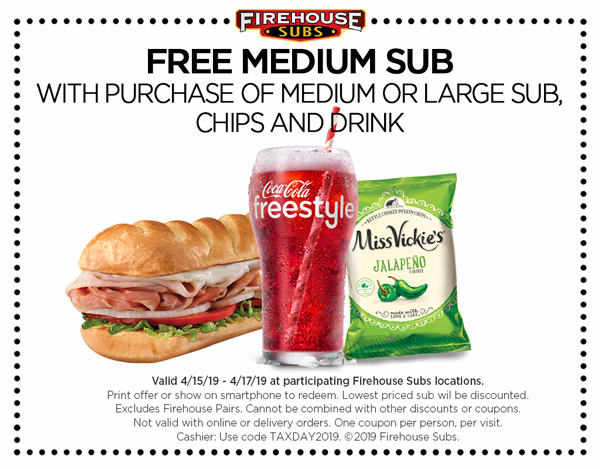 Firehouse Subs – Stop by to receive a free medium sub when they purchase a full price medium or large sub, chips and a drink (valid 4/15/19-4/17/19). Please click here for a link to the offer. Great American Cookie Company – This is becoming a fun tradition! They are offering a free Chocolate Chip cookie to customers who stop by participating stores on April 15. Limit one per customer, while supplies last. Hardee’s or Car’ls Jr. depending on where you live 🙂 – Free Sausage Biscuit on April 15, 7-10 a.m. Be sure to say the password, “Made from scratch,” to redeem. Hot Dog on a Stick – What might Hot Dog on a Stick possibly offer as a freebie for Tax Day? How about a hot dog on a stick? Though, it’s limited to turkey and veggie dogs. Kona Ice – Chill out day! Get a free shave ice at a Kona truck on 4/15. Noodles & Company – NoodlesREWARDS members will get $4 off online and mobile orders of $10 or more for Tax Day. P.F. Chang’s – Get $10 off $50 off online orders 4/12-4/21 with promo code TENOFF. Pizza Hut – Through Monday $5.99 two-topping pizza! Potbelly Sandwich Shop – BOGO Sandwich on Tax Day when you mention that it’s tax day. Quiznos – They are offering 10.40% deduction off any purchase including catering, on April 15 to loyalty members at all participating U.S. locations. Also, Quiznos fans who download the Toasty Points loyalty app will receive a free 4-inch sub upon download. Schlotsky’s – Get a free small original sandwich with the purchase of chips and a medium drink. Sonic – All day at sonic Score get half-price cheeseburgers on their single patty Sonic burger. Tropical Smoothie Cafe – Download the Tropical Rewards App and receive an exclusive reward for app users on Tax Day (will be delivered via the app). White Castle – Use this coupon to get 15% off your order on Tax Day. Office Depot and OfficeMax – From now until 4/27/19, use THIS COUPON for 5 pounds of free shredding! DISCLAIMER: Before you run down to your local store… PLEASE double check that their location is participating in today’s tax day saving deals.Let me know if you find any more deals and I will add them to the list! Have you found other deals today? ?Let me know and I’ll update the list! !